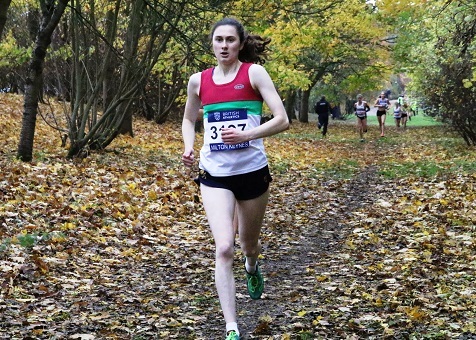 Banbury Harrier Emily Thompson's excellent new year form has earned her international selection with a call-up to the England Senior indoor athletics team. Thompson, now studying and training at Birmingham University, will compete for England at the Elan Indoor Athletics Meeting staged in the Slovakian capital, Bratislava, next Sunday (27th January). Her selection for the 800m event came after a series of top performances in recent weeks. On New Years Day she ran 800m indoors at Lee Valley in London, posting a big indoor best of 2 mins 08 secs, a time that took her to the top of the Under 20 Women's national rankings for the winter season and to second in the Senior rankings. She followed this 6 days later with another indoor best, this time in the 1500m, when she ran a time of 4 mins 29 secs at the British Milers Club meeting in Sheffield to go 6th in the Senior indoor 1500m rankings. Thompson went on to demonstrate her versatility and endurance by leading home her Birmingham University team to victory in the Midland Women's Cross Country League fixture on 12th January. 156 women from across the Midlands contested the 4-mile course on the challenging Burton Dassett hills, with Thompson judging her run well to finish strongly in 26 mins 31 secs, claiming an impressive fourth place. With team mates Emma Houchell (5th), Sabrina Sinha (6th) and Louisa Whittingham (17th) making it an impressive team performance for Birmingham, they did enough to secure the overall team victory ahead of Loughborough University.